Researchers Ryan Hartwig and Patricia L. Sitlington interviewed 25 employers representing a range of occupational categories to determine the effect that different types of diplomas may have on the employment of young adults with disabilities. • Occupational diploma: A diploma that students receive for completing the requirements specializing in certain occupations, that is, metal fabricating, auto mechanics, carpentry, or other skills areas. • Certificate of completion, attendance, or achievement: A diploma offered to students who have met the requirements of their special education program but not the requirements of the school’s general education program. • GED: A diploma offered to those who take the coursework and pass an exam offered by community colleges and/or high schools that covers very basic curriculum in the areas of math, science, reading, and writing. 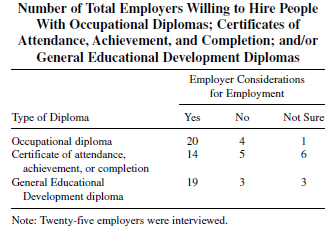 The primary interest of almost half of the employers’ was whether prospective employees had graduated from high school rather than the specific type of diploma earned. Employers with no preference between types of diplomas said they were more willing to look at the individual’s characteristics and how well he/she performs during the interview. They also indicated a tendency to look at a person’s work ethic and expect those they hire to have a strong work ethic. However, employers’ willingness to hire students with each of the three diploma types presented in the interview varied significantly. While small, the group of employers interviewed for the study was determined to be representative of occupational categories. However, the researchers could not control for the influence of the employers knowledge of the requirements of the ADA or the positive and negative experiences they may have encountered with employees with disabilities. Also, responses from employers in other areas of the country may differ from these findings. • Employers are willing to look at the individual characteristics of prospective employees rather than the type of diploma held. • As a whole, employers were most willing to hire those with occupational diplomas (80%) and those with GEDs (76%). Parents and special education advocates can draw on this research to help in transition planning for young people with disabilities. IDEA 2004 requires that transition planning include “appropriate measurable postsecondary goals based upon age appropriate transition assessments related to training, education, employment, and, where appropriate, independent living skills” (34 CFR 300.320 (b)(1)). According to Dr. Larry Kortering, Project Co-Principal Investigator at the National Secondary Transition Technical Assistance Center, the transition assessment process must be “multifaceted and ongoing” and the assessment results must be used as a “driving force for a student’s high school education.” Teachers should use assessment results to link what students are doing in school to what they want to do when they leave school. Lastly, transition planning should also include adult service providers to help with the student’s transition from school. It is critical for transition planning to include the type of diploma the student is expecting to earn. Both students and parents should be involved in this decision. Students should be encouraged to earn a regular high school diploma if at all possible—even if that diploma takes longer to obtain than the standard number of years, typically four. Both parents and students should understand the implications of earning something other than a regular high school diploma. The Research: Employer Perspectives on High School Diploma Options for Adolescents With Disabilities, Ryan Hartwig and Patricia L. Sitlington, University of Northern Iowa. Published in Journal of Disability Policy Studies 2008, Volume 19 Number 1, June 2008.